It is easy in the post-rickrolling era to forget the level of popularity that Rick Astley achieved during his late-1980s peak. With 40 million records sold, 8 UK and 5 US Top 10 hits as well as concert appearances with rock royalty like Phil Collins and Brian May (watch the clip—I swear this is not a rickroll)—all by the age of 25—Astley was a truly global phenomenon and, alongside Kylie Minogue, the symbol of the Stock-Aitken-Waterman songwriting and production team’s imperial period. Astley went into semi-retirement after 1993’s Body & Soul, releasing music sporadically (a handful of singles and a pair of albums saw the light of day, one more album was scrapped), working as a radio DJ and occasionally returning to the stage, often as part of ’80s revival tour packages. This all changed in 2016, as Astley turned 50, released the self-penned and self-produced 50 (his first UK no. 1 album since his 1987 debut) and announced his first four North American dates in 25 years. This could all have gone terribly wrong: announced only a few weeks earlier, Astley’s first Toronto concert in 25 years had to compete with both Thanksgiving dinners and a Blue Jays playoff game, and the singer joked early on that he expected to perform for an empty room, perhaps “two men and a dog”. On the contrary, the Phoenix was nearly full and the all-ages crowd roared with delight when a trim, youthful-looking Astley joined his sharply dressed five-piece band to kick things off with the throbbing electro-rock of “This Old House”. While the choice of opener may have surprised those who expected the night to be a nostalgic trip back in time, it also served notice that Astley doesn’t see 50 as simply an excuse for touring again, but is rightly proud of the album, half of which made it into the set. The new material touched on post-Sam Smith gospel soul (“Keep Singing” , “Pray for Me”), inspirational AOR (“Angels on My Side”) and bubbly, breezy pop (“Dance”), and was very warmly received by a Toronto audience that was probably largely unfamiliar with most of it (50 was only released this past Friday in Canada). Of course, the state-of-the-art 1980s SAW productions that rocketed Astley to the top of the charts made up the bulk of the setlist, and those big, bright, insistent hooks are as instantly hummable today as they were nearly thirty years ago. The Day-Glo sugar rush of “Together Forever”, the soulful “It Would Take A Strong Strong Man” (a number 1 hit in Canada back in 1988), the ebullient “She Wants to Dance With Me” and the dramatic “Hold Me in Your Arms” all sounded as vibrant as ever—thanks in no small part to Astley’s voice, which showed no rust or sign of age and sounded even richer and fuller than it did back when the singer was in his 20s. The band mostly stuck to the original arrangements, but there were a few notable new wrinkles: “Take Me to Your Heart” was given a bit of an EDM facelift and incorporated elements of Rihanna’s “We Found Love” (it worked surprisingly well), while “Cry for Help” included a reggae-lite medley of 1980s hits that doubled as a great showcase for Dawn Joseph’s strong vocals. If he weren’t blessed with that star-making voice, Astley could still easily coast on the strength of his charisma and charming, self-deprecating and often surprisingly profane stage banter on everything from his famously awkward dancing skills (“There will be no dancing of any kind from me tonight…we can’t afford the insurance”) to the wisdom of middle age (“Life has taught me, you get to a certain age and you don’t give a monkey’s a-hole”). Astley is a great singer and a terrific entertainer who, like all great entertainers, knows the two key rules to a memorable performance: give the people what they want, and always save the best for last. After an unexpectedly sturdy cover of “Highway to Hell” that showed off Astley’s drumming (!) and a rendition of “Lights Out”, a relatively recent non-LP single, the singer closed out the night with a one-two punch of “Whenever You Need Somebody” and an inevitable, immortal, still-unstoppable “Never Gonna Give You Up” that left everyone in the room grinning from ear to ear. 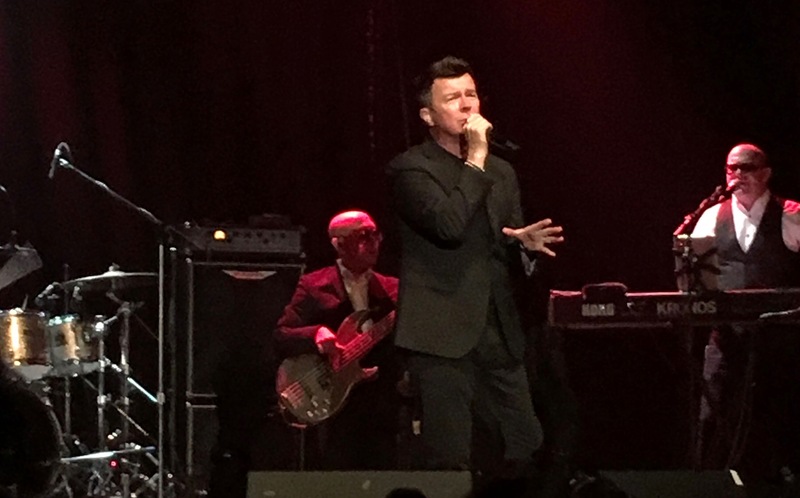 From the sudden fame to the self-imposed withdrawal from the industry, to the unexpected, Internet-driven revival and now the career resurgence, Rick Astley has certainly been through quite a rollercoaster ride. By all accounts one of the nicest, most down-to-earth people in the music industry (his recent AMA suggest that his self-deprecating stage banter is no act), the singer seems poised to make the most of this well-deserved second act—one that will hopefully make its way back to these shores very soon for a much more extensive North American tour.